A swap is a derivative contract through which two parties exchange financial instruments. These instruments can be almost anything, but most swaps involve cash flows based on a notional principal amount that both parties agree to. Usually, the principal does not change hands. Each cash flow comprises one leg of the swap. One cash flow is generally fixed while the other is variable, which is based on a benchmark interest rate, floating currency exchange rate, or index price. The most common kind of swap is an interest rate swap. Swaps do not trade on exchanges, and retail investors do not generally engage in swaps. Rather, swaps are over-the-counter contracts primarily between businesses or financial institutions. In an interest rate swap, the parties exchange cash flows based on a notional principal amount (this amount is not actually exchanged) in order to hedge against interest rate risk or to speculate. For example, say ABC Co. has just issued $1 million in five-year bonds with a variable annual interest rate defined as the London Interbank Offered Rate (LIBOR) plus 1.3% (or 130 basis points). LIBOR is at 1.7%, low for its historical range, so ABC management is anxious about an interest rate rise. They find another company, XYZ Inc., that is willing to pay ABC an annual rate of LIBOR​ plus 1.3% on a notional principal of $1 million for 5 years. In other words, XYZ will fund ABC’s interest payments on its latest bond issue. In exchange, ABC pays XYZ a fixed annual rate of 6% on a notional value of $1 million for five years. 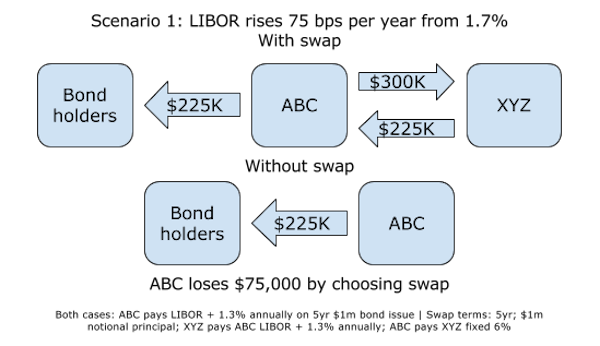 ABC benefits from the swap if rates rise significantly over the next five years. XYZ benefits if rates fall, stay flat or rise only gradually. 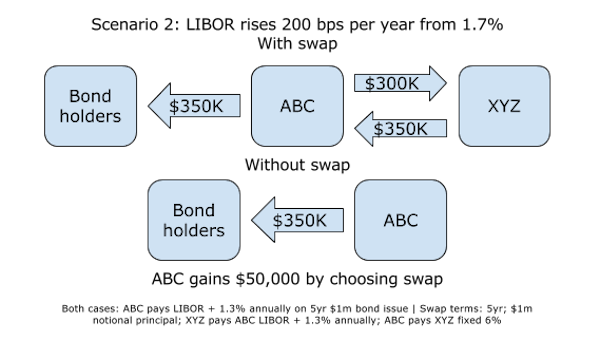 Below are two scenarios for this interest rate swap: 1) LIBOR rises 0.75% per year, and 2) LIBOR rises 2% per year. and receives $225,000 in return (the same as ABC’s interest payments to bond holders). ABC’s net loss on the swap comes to $300,000 – $225,000 = $75,000. XYZ pays this amount to ABC, and ABC pays XYZ $300,000 in return. ABC’s net gain on the swap is $50,000. Note than in most cases, the two parties would act through a bank or other intermediary, which would take a cut of the swap. Whether it is advantageous for two entities to enter into an interest rate swap depends on their comparative advantage in fixed or floating rate lending markets. The instruments exchanged in a swap do not have to be interest payments. Countless varieties of exotic swap agreements exist, but relatively common arrangements include commodity swaps, currency swaps, debt swaps, and total return swaps. Commodity swaps involve the exchange of a floating commodity price, such as the Brent Crude oil spot price, for a set price over an agreed-upon period. As this example suggests, commodity swaps most commonly involve crude oil. In a currency swap, the parties exchange interest and principal payments on debt denominated in different currencies. Unlike an interest rate swap, the principal is not a notional amount, but is exchanged along with interest obligations. Currency swaps can take place between countries. For example, China has historically entered into swaps with Argentina, helping the latter stabilize its foreign reserves. A debt-equity swap involves the exchange of debt for equity; in the case of a publicly traded company, this would mean bonds for stocks. It is a way for companies to refinance their debt or re-allocate their capital structure. In a total return swap, the total return from an asset is exchanged for a fixed interest rate. This gives the party paying the fixed rate exposure to the underlying asset—a stock or an index, for example—without having to expend the capital to hold it.